"Carnival Vista will offer a wide variety of well-appointed, beautifully designed staterooms and suites including two new accommodation classes. Tropics-inspired Havana Cabanas feature accommodations with private outdoor patios – complete with lounge chairs and hammock – that face the expanded Lanai ocean-air outdoor promenade and offer magnificent sea views in addition to easy access to the Havana Bar and Pool. " "Located within a new dedicated family zone on Deck 2, the new Family Harbor accommodations offer an array of deluxe ocean-view, balcony and interior staterooms that accommodate up to five family members. Parents and kids will have even more room to relax at the new, exclusive Family Harbor Lounge, a secluded space designed as the ultimate family hang out with large-screen TVs, games and complimentary breakfast and snacks. A special family concierge desk will be available here to assist families in making this their best vacation ever." "The luxurious two-level Cloud 9 Spa will feature an array of chill-worthy amenities, including a thalassotherapy pool, four steam chambers, the line’s first infrared sauna and hamam, and special “experience showers” that provide a soothing fragrance element, along with a high-tech indoor cycling studio. Guests can get away from it all at the adults-only Serenity retreat, where there’s breathtaking views, tranquility and even more lounging options to relax including the line’s first outdoor massage huts." "As the family cruise leader, carrying more than 700,000 children on board each year, the company designed Carnival Vista with even more fun for families day and night. The indoor/outdoor Camp Ocean for children under age 12 is a dedicated undersea-themed play space with more than 200 fun and educational ocean-inspired activities. Carnival Vista will be the second ship in the fleet to feature Dr. Seuss Bookville, a special reading and play space inspired by the whimsical world of Dr. Seuss. Here kids and their families can read beloved Dr. Seuss books, make arts and crafts and stretch their imagination with toys and games. Also part of the line’s Seuss at Sea program, Carnival Vista guests can enjoy Green Eggs and Ham with The Cat in the Hat and Friends character breakfast, the Seuss-a-palooza Story Time and Parade and more. 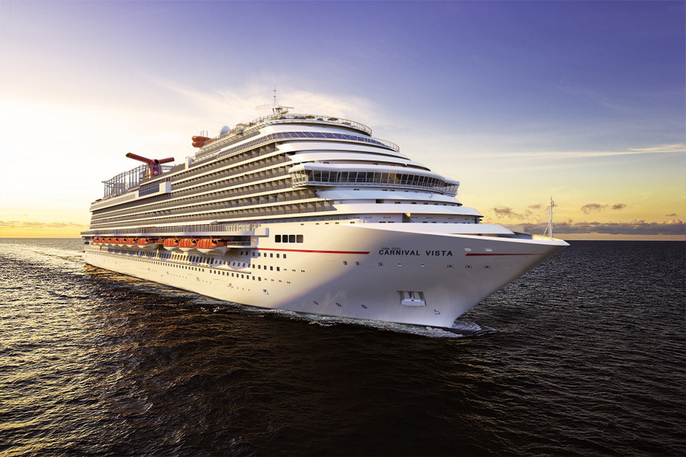 Carnival Vista will also introduce four new games at the family-centric HASBRO the Game Show, as well as special family-friendly comedy performances at Punchliner Comedy Club presented by George Lopez."